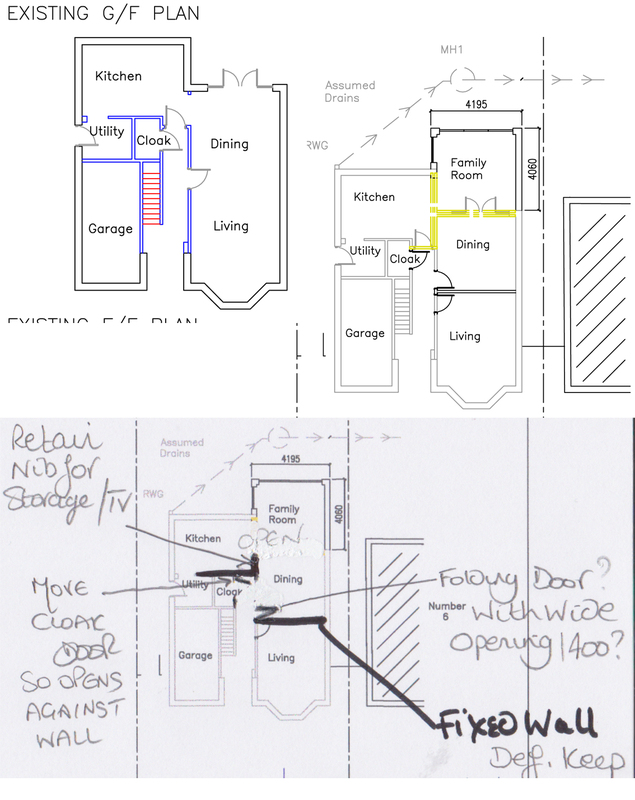 Blog Reader Advice: Ground floor extension layout & how open plan to go? Whilst doing the HomeSense inspiration day the other week, a lady approached me to ask a question which didn’t quite fit into the “which colour cushion goes with this sofa” category. She asked if I was a *proper* interior designer and began to describe her home, on which building works are due to commence. She was really unsure about the ground floor layout: which walls to take out & which to leave. Budget constraints weren’t the issue, getting the layout spot on was – this was to be her family’s Forever Home. We talked about ideas and theoretical designs but it was impossible to give proper advice without seeing the layout, so I suggested she whizz her drawings over via email. And she did! You can see the original layout top left. There is currently a large through living and dining with separate kitchen to the rear left. It’s amazing when you look at a house in this way how much ‘wasted’ space there is which isn’t lived in, e.g. here the garage, hallway, cloak and utility is about 40% of the ground floor. As you can see there are lots of yellow walls on the builder’s plan as options on the top right, and any could be left in or taken out with the proper structural work in place – their job not mine! Their dream is for a family room extension to the rear, but there are so many options, the owner was getting lost in decision making and wasn’t sure what configuration would work internally. Could I help? My immediate quick sketch ideas? Create a stud wall between the existing dining and living room to create a grown up space / separate quiet room where the existing living space is. Open plan living is fabulous but most families appreciate a separate living area if possible. Create one big space consisting of the old dining area and the new family room. The back of the house is N & E facing, making it quite dark so a large room will bounce more light round. This type of open plan living has become (as we all know) extremely popular with families and is likely to raise the value and attractiveness of the property. Slide the wall at the top of the hall up a tad to create a longer kitchen wall, maybe for a tv or open shelves. A kitchen wall is being lost when the room is opened up to the new family space and storage is essential. Maybe even create a little nib corner, as I’ve shown on my rough sketch, to allow 600 deep units if required. This therefore still allows for a big opening from the kitchen to the new family room but retains options for important kitchen storage. Create impact and wow factor with a large folding door into the dining room from the hallway. This also means no impairment of view if double doors were used & opened into the room. Open plan living is brilliant but always think about storage, furniture, wall space and how you’ll use it. These initial layout plans are VITAL to get right when you are spending many many thousands to change the way you live! Finding a trade – Is cheapest REALLY the best? The Home Bar is Back. No, really, it is. Still a lot of finishing touched to do to inject a bit of colour though!